Centipede like, with additional warring mushrooms! 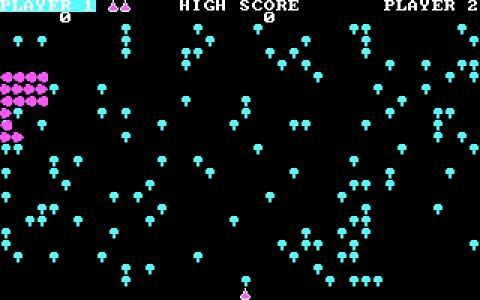 The core of this game is stapled in the shoot and dodge mechanic that made Centipede the retro monster that it is. Also, Mushroom Mania is a cool game in that it managed to create a pretty cool looking graphics setting even in spite of the EGA graphics and in spite of the fact that it is very limited in scope. Also, what is pretty cool about it is the fact that it has a cool backstory; if you pause to read the scrolling text screen at the beginning you find out that you are really a force of good in the kingdom of the mushrooms! In terms of controls, I have no complaint, the game has both very simple controls, that work immediately. Now, the tactic best used to win is to try and destroy the mushrooms first, so you can just focus on the centipede creature afterwards; it takes a while to sink with the groove of the game, but once you do it, you'll find that it is pretty addictive, though in a good way. 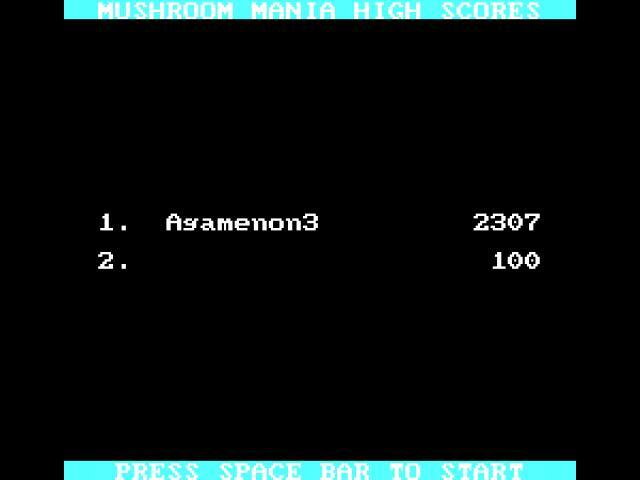 So, if arcade retro shooting is what you are looking for, Mushroom Mania will definitely offer you a good, long lived experience. Totally worth downloading!